How To Boost Your Team's Hitting, Pitching, Fielding and Baserunning... All While Your Practice Runs On Auto-Pilot! ...In just 90 seconds, you can discover the embarassingly simple secrets to running greasy-smooth, outrageously effective practices that'll have your kids jumping for joy (and their parents showering you with praise). And this stress-free system is so darn easy to implement... your practices practically run on their own! 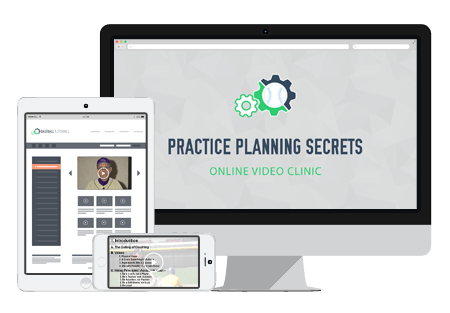 The Practice Planning Secrets online video clinic breaks down a proven, step by step strategy for running a top notch practice. From how to structure your practice... how to motivate your players... to specific drills you can run to maximize your field time. Here's a small sample of what you'll learn. How to develop a complete season practice plan ... step by step instructions for pre-season, indoor, in-season, playoff prep and off-season workouts. The number 1 coaching "trap" former players fall into. How to identify and avoid this "role-confusion" pitfall like the plague! The single biggest "key" to effective batting practice - 85% of youth coaches get this DEAD WRONG! How to use the "Team Time" drill to get every player on your team working simultaneously... this incredible "mega-drill' does the work of 14 drills in 1!